We are going through a shift in consciousness that is affecting how we think, how we feel, and how we are experiencing time. This work is my offering and my blessing to dedicated light workers on the path who have eyes to see and ears to hear. Energy medicine can be used for personal healing or for integrating the spiritual changes that are affecting our bodies and our DNA. Mary offers online and on- sight seminars for personal growth or professional training for healers. Stay on the Cutting Edge of the Evolution of Consciousness with Mary on her Blog. 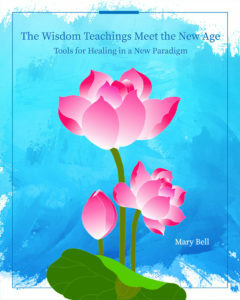 Mary Bell is a spiritual healer, author, teacher, and channel who has been in private practice for over twenty years. We are on an evolutionary path that includes the Wisdom Teachings but goes beyond them. This is the nature of evolution. As our consciousness evolves, we can take the best of the Wisdom Teachings and combine it with what we are learning in this incarnation through Psychology, Physics, life experience and through our Direct Experience.This is the way that the evolution of our consciousness occurs_ the Old teachings and the New merge into something greater_ creating new form and building the foundation for a New Age! We are living in extraordinary times in which we are experiencing a global shift in consciousness that is affecting how we feel, how we think, and how we are experiencing time. This Shift results in viewing reality from another perspective, a perspective that sees the bigger picture, the Unity in all things, and recognizes the God Self within. We are integrating that change now personally and collectively.